This document is an online document. You may save this PDF file or print it out. QHYCCD reserves the right to change this user manual without prior notice. 4. QHY294C camera supports SharpCap as the shooting software. Please download and install SharpCap software. QHY294C can be used in SharpCap version 2.9 or higher. If you are unable to access the official website of SharpCap in China, QHYCCD has obtained the consent of the author to provide download of its installation package. Note that for the latest version of SharpCap, QHY294C also needs the latest qhyccd.dll, for which QHYCCD has written the SharpCap patch, please download and install it. 5. 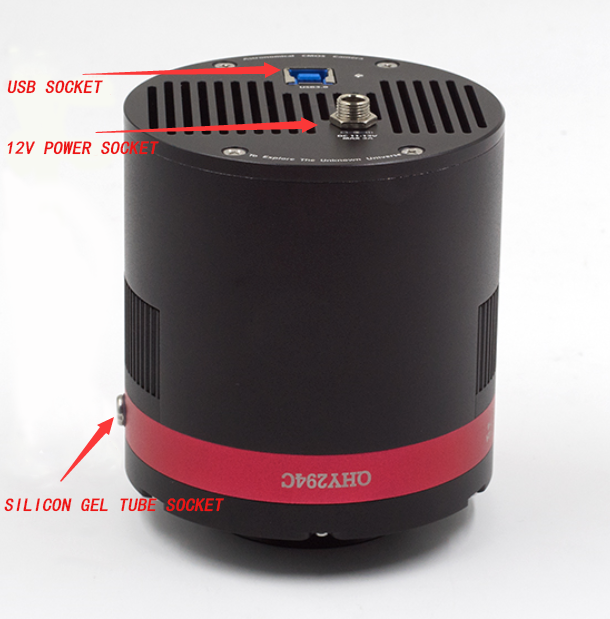 First connect the QHY294C to the 12V power supply, then connect the QHY294C camera to your computer via the USB3.0 cable. Make sure the QHY294C is plugged in before connecting the camera to the computer, otherwise the camera will not recognize it. When you connect for the first time, the system discovers new devices and looks for drivers. 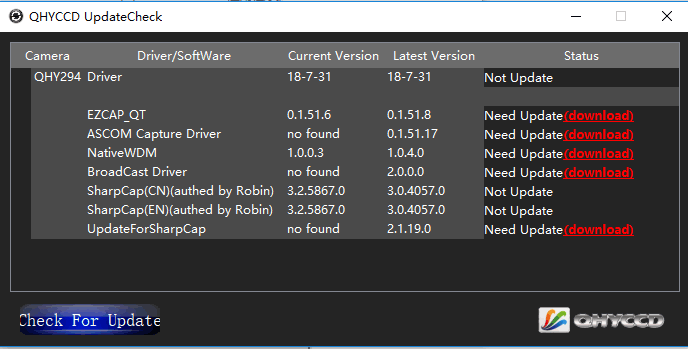 You can skip the online search step by clicking "Skip driver software from Windows Update" and the computer will automatically find the driver and install it locally. 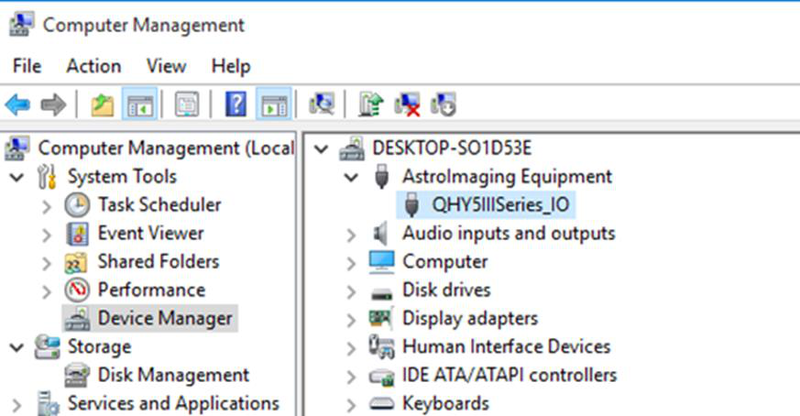 When the driver software is successfully installed, you can see QHY5IIISeries_IO in the device manager, as shown below. 7. In addition, QHYCCD has also developed an update check tool (link). 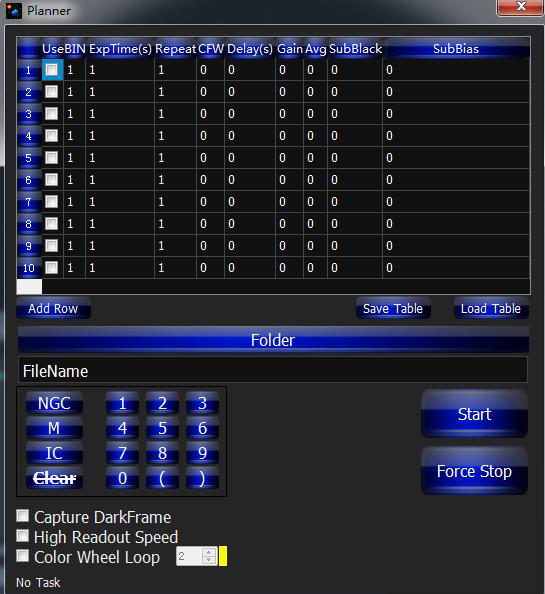 After downloading and installing this program, you can use this software to check if the driver required by the camera is the latest version. . If it is detected that your driver is not the latest version, you can download the latest driver directly to update the driver through this software, without having to go to the QHYCCD official website to download. Once you have downloaded and installed the new driver, unplug the USB cable and plug it in again for the new driver to take effect. 1. Connect the QHY294C to the 12V power supply and connect your QHY294C to the computer using the USB3.0 data cable. 2. Turn on SharpCap. 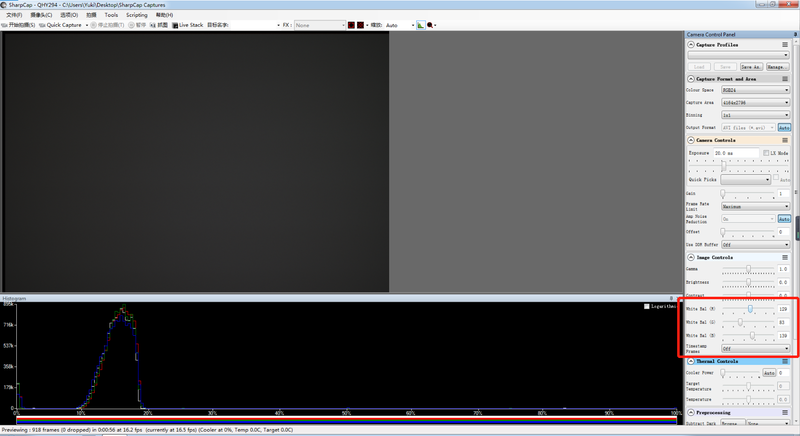 If the software and drivers mentioned above are installed successfully, the video image will appear automatically, and you can also see the frame rate in the lower left corner of the software, as shown below. 3. 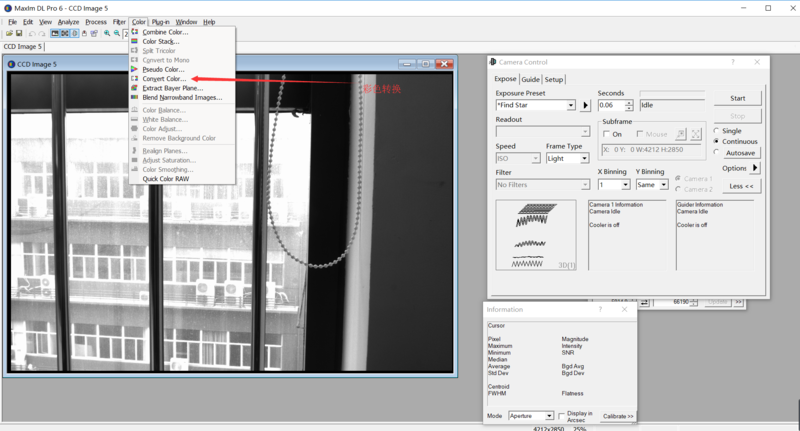 If you have already started the SharpCap software before connecting the camera, in order to open the camera, you can click on the camera in the menu bar and then select QHY294C. 4. 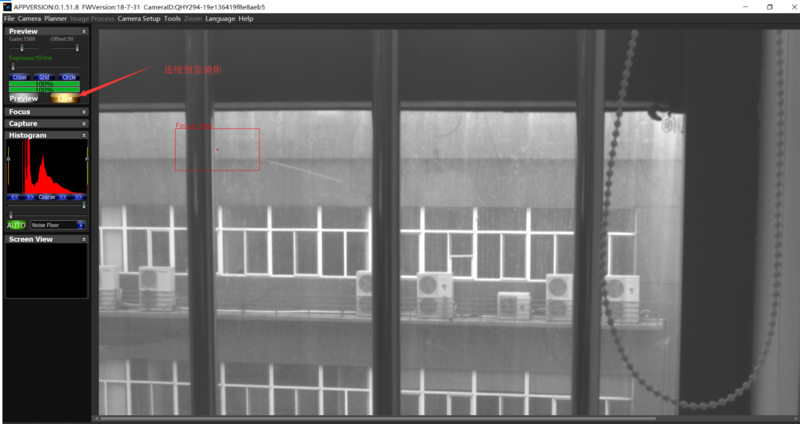 Offset adjustment, when you completely block the camera, you may find that the image is not really black. Sometimes this will reduce the quality of the image contrast. You can get a better dark field by adjusting the offset. You can confirm this by opening the histogram as indicated in the figure below. The QHY294C is a color camera. 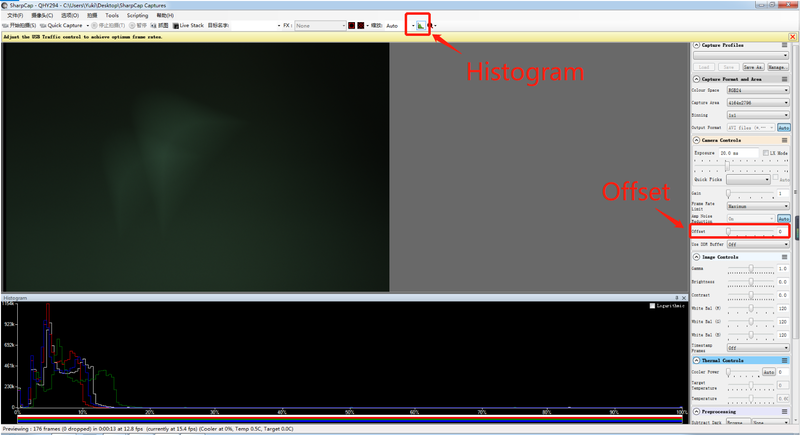 It is very important to set the offset to a small value so that the peak of the histogram is close to zero. Because the white balance of a color camera is the product of the pixel value and a ratio in the FPGA, the offset is also multiplied by it, which may affect white. 5. If you want to enter the 16bit image mode, it is best to temporarily set the USB traffic to 20 or above, and then adjust to the "RAW16" mode, otherwise the USB transmission will be terminated because the data bandwidth may exceed the transmission capacity. 6. By selecting the “LX” mode, you can extend the exposure duration range for long exposures. The QHY294C is equipped with an amplifier illuminance suppression circuit that greatly suppresses the luminescence generated by the amplifier during long exposures. It should be noted that since the internal circuit of the CMOS chip mounted in the QHY294C is highly integrated and cannot be completely controlled by an external circuit, it is impossible to completely suppress the corner light. It is normal to see some corners when you are making long exposures. A long exposure image at 0°C, 5s exposure time, 50% gain setting. 6. After the QHY294C is connected to the 12V power supply, the temperature control circuit will be activated. 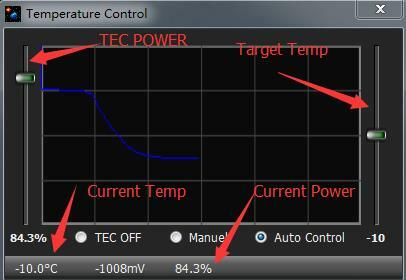 You can control the CMOS temperature by adjusting the settings in the figure below. There are two main ways to control the temperature. One is to adjust the Cooler Power and the other is to set the Target Temperature. If you want to directly control the CMOS temperature by setting the target temperature, you should first click "Auto" to adjust the slider to set the target temperature. Before using the cooling function, you should first read the FAQ "How to protect the chiller" for better use of the cooling function. 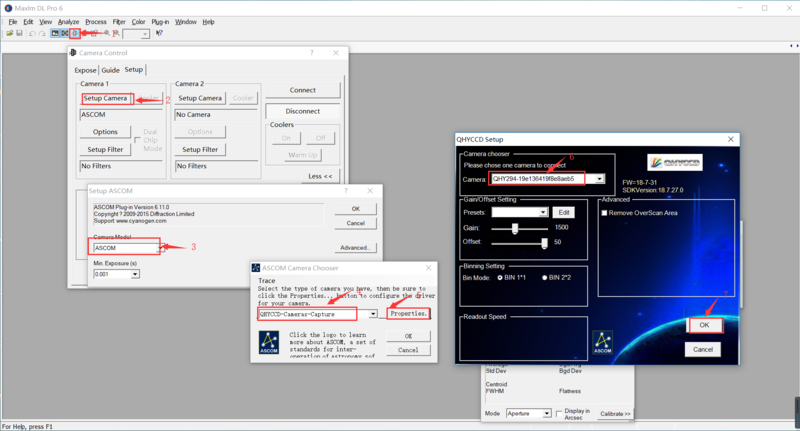 SharpCap will use the default white balance setting when starting up. 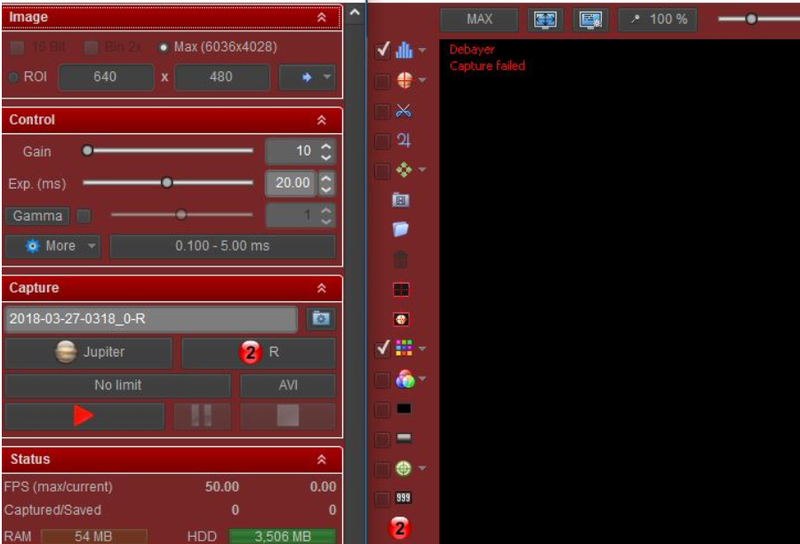 For color cameras, SharpCap will display red, green and blue adjustment sliders on the right side of the software. Because white balance is the ratio of red to green, and the ratio of blue to green, you can hold the green component to a value and then adjust the red and blue components. It should be noted that the white balance RGB gain of QHY294C is the digital gain used. The digital gain is the digital signal output after ADC conversion, and multiplied by a coefficient, it will not improve the signal-to-noise ratio, so it is recommended to use a lower value. .
For example, in the figure below, the blue component is 139, the red component is 129, and the green component is 83. It seems that the white balance of this picture has been well adjusted. As mentioned earlier, if you are doing a planet shot, you should set the Offset value to a minimum to make the background black. Then you can easily get the right white balance, otherwise adjusting the white balance will not be so easy. Sometimes the offset value of the image is good, but you don't get the right white balance. The reason is that the white balance is actually a ratio of the RGB sensitivity difference. So we use a scale to multiply the RGB values. However, if the offset exists, this ratio will be incorrect. For example, if the sensitivity of G is twice the sensitivity of R, in order to obtain white balance, we multiply 2 by R to get R'=2R=G, so that R=G. Now R'': G'' = (R + bias) / (2R + bias), but it is not equal to 1:2. This indicates that the offset affects the ratio of R to G. In addition, the ratio of R to G also changes with the brightness of the subject being photographed, so it is difficult to obtain a white balance with a fixed ratio. However, for deep space target shooting, you should keep a certain offset to avoid the image background becoming 0 to avoid losing part of the image background. Generally speaking, the background is 1000-5000 (for 16BIT images), which is a good value for deep space shooting. QHY294C works on many software that supports the ASCOM platform. Currently QHY294C only supports regular ASCOM connection, but does not support ASCOM VIDEO connection. 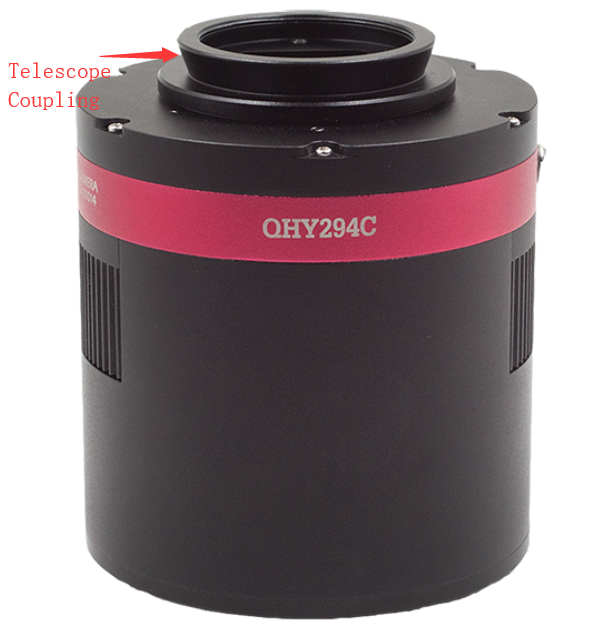 It should be noted that the QHY294C will always transmit the largest bit depth to get the best DSO imaging performance. The format of the image is 16bit, the high bit is aligned, and the low bit is zero. 1. First you need to confirm that the ASCOM platform and the ASCOM driver have been successfully installed. 3. Follow the prompts below to complete the setup. EZCAP_QT is a software developed by QHYCCD. 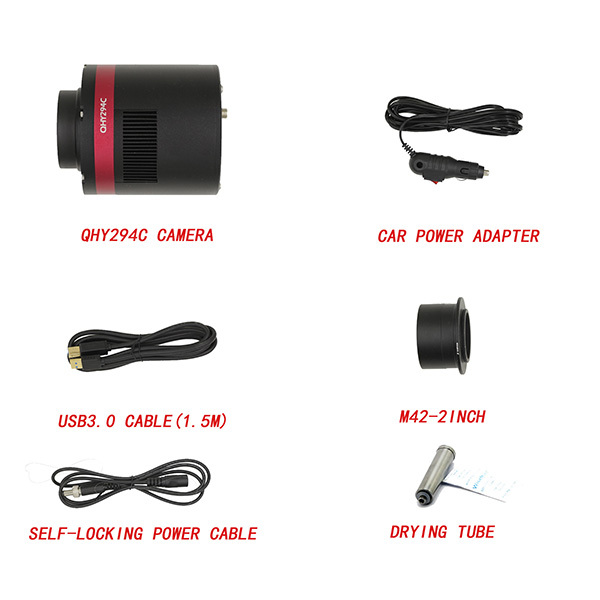 It has basic shooting functions for the QHYCCD deep space camera. You can download and use it in the link below. 2. First connect the QHY294C to the 12V power supply, then connect the QHY294C camera to your computer via the USB3.0 cable. 4. 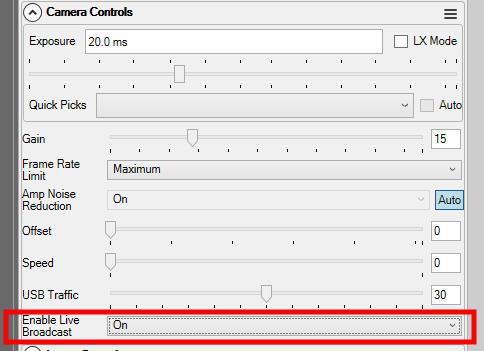 Click “Temperature Control” in “Camera Settings” to set the temperature of the CMOS sensor. You can turn on “Auto” to set the target temperature. For example, here we set the target temperature to -10C. The temperature of the CMOS sensor will drop quickly to this temperature (approximately 2-3 minutes). If you want to turn off cooling, you can choose Stop. If you only want to set the cooling power without setting the temperature, you can set the percentage of power. 5. You can use the preview tab to preview and use the focus tool to focus. Then use the Capture tab to capture the image. 6. 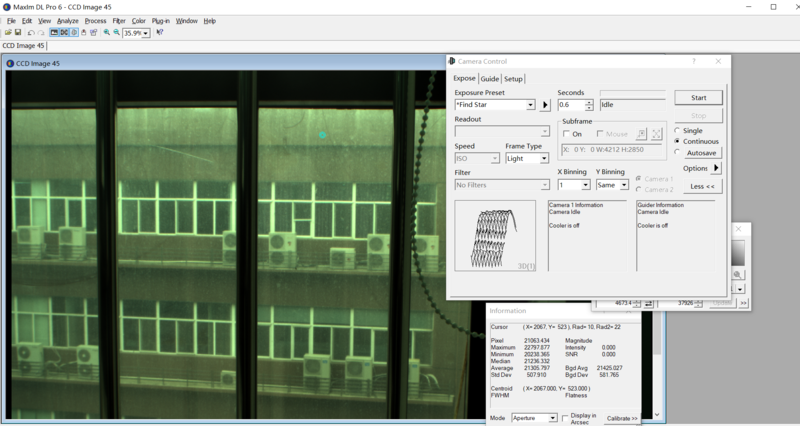 There is an image task planner in EZCAP_QT, you can take a series of images with reference to the following table. The latest version of FireCapture already supports QHY294C. Please download its v2.5 BETA (32-bit) version. version from FireCapture's official website. By default it will be installed in the "Documents" folder. When it is successfully installed, find the "Documents" folder and you will see its installation directory. As shown below. Enter the folder, launch "FireCapture.exe", then the software will prompt the user to select the camera, here choose QHYCCD. Once the loading is complete, you should be able to see the images taken by QHY294C on FireCapture. As shown below. For a more detailed tutorial on using this software, please read its tutorial section on its official website. The webcam is a special feature supported by the QHY294C that sends video images to multiple target software via the BroadCast Video WDM Drive. 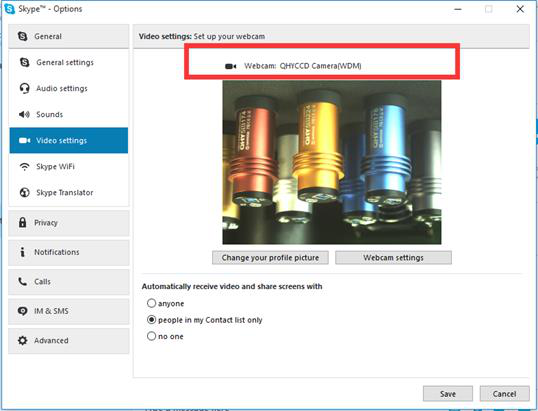 For example, you can use SharpCap software to control the QHY294C camera, while the video images displayed on SharpCap can be sent to any WDM-enabled software such as HandyAvi, Adobe video encoder and instant messaging software. This feature is very convenient for video online broadcast applications. 3. 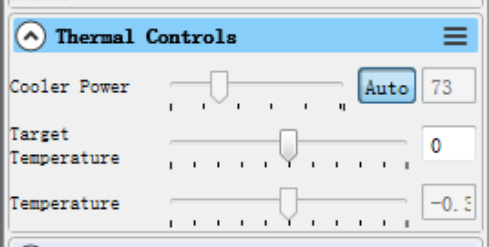 Open "Enable Live Broadcast" in the control panel of SharpCap as prompted below. 4. As shown below, in the software you are using, select QHYCCD camera (WDM) as your webcam. 1. How to avoid camera stuck? If the camera is stuck all the time, it may be caused by a variety of reasons, you can follow the prompts below to check. 1) Whether your computer is configured with a VIA chipset or some type of motherboard, it does not appear on SharpCap (but works on ASCOM). In this case, you need to turn on the camera's DDR buffer. 2) Is your computer and equatorial device leaking? This may cause leakage current to be transferred from the computer to the camera through GND. This may affect USB transmission, loss of data packets, and camera jam. You need to make sure the computer and the equatorial mount are well grounded. 3) Is the voltage of the USB interface high enough? Some computers have a USB interface voltage of less than 5V. This may cause the camera to get stuck. In this case, you can choose to connect the computer to the camera by using the USB3.0 Hub with power supply, which ensures that the camera gets 5V. 4) Is the CPU usage too high? If the CPU usage is too high, it will cause many frames to be lost and the camera will be stuck. You can increase the USB traffic value to lower the FPS for more stable image transmission. 5) Is the USB cable securely connected? Sometimes problems with the connection of the camera to the USB cable and problems with the connection of the computer to the USB cable can result in loss of signal and jamming of the camera. Especially when the USB cable is moving. In this case, you can try applying some silicone oil to the USB connector and the socket section. This will make the USB connection more stable. 6) Avoid static electricity. Sometimes static electricity carried on the human body can cause the camera to become stuck. Before touching the camera, you can touch the computer case to discharge static electricity. 7) Some computers have a front USB interface that is not suitable for high-speed data transmission (because they are connected to the motherboard through a cable, which makes signal integrity worse). 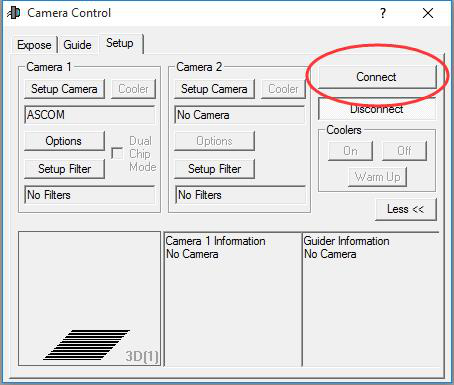 If you find that the camera is stuck when the front USB port is in use, you can try connecting the camera to its rear USB port (they are directly connected to the motherboard's chipset). 2. How to clean the CMOS sensor and optical window? If you find dust on the CMOS sensor, you can first unscrew the front half of the QHY294C and then clean the CMOS sensor with the cleaning kit for the SLR camera sensor. Because the QHY294C's CMOS sensor has an AR coating, care must be taken during the cleaning process. The glass window has an infrared filter coating and an anti-reflection coating. Therefore, care must be taken during the cleaning process. You can also use the SLR cleaning tool or lens paper for cleaning. Note that the force should not be too large, because the coating is very fragile and can be easily scratched. 3. What is the performance of the corner light suppression function of QHY294C? The amplifier glow is a semiconductor structure of the internal circuit of a CCD or CMOS chip, and emits a very weak near-infrared light in the presence of a certain voltage difference. The QHY294C camera has an amplifier illuminance suppression circuit that greatly reduces the illuminance of the amplifier during long exposures. It should be noted that due to the internal CMOS chip configuration, it is impossible to completely suppress the corner light. When you make long exposures, you can still see some corners of the light, which is normal. The image below shows the 60s exposure at high gain. When the exposure time is longer, the glow on the right will be more noticeable. But don't worry, using dark field calibration can completely eliminate corner light. Dark field calibration requires a dark field to be taken at the same cooling temperature and the same exposure time. 4. What is the camera's built-in DDR buffer? What are its advantages? It can buffer the entire image to avoid loss during USB transmission. Because the CMOS sensor will continue to be exposed as soon as it starts working, the image will be output, and it will not stop. However, the computer will pause the USB transfer because of the multitasking characteristics of the operating system. If the pause time is too long, the buffer with small storage capacity in the USB will be full, resulting in the loss of the upcoming data. It is also possible to cause partial data loss of one frame to form a bad frame. For short exposures, this may not cause too much problems, but for long exposures, this means losing a long exposure image. The 128MB DDRII buffer solves this problem by storing and transmitting the entire frame of images. Even if the USB transfer is paused for a long time, no data will be lost. Another advantage is that when using some computers that are not running fast or have poor support for USB3.0, it will make the video images more delicate and smooth. These computers can't transfer high-speed data well, and the data will often be lost. With DDR. A buffer that buffers a lot of image data and sends it to the computer. Even if USB 3.0 frequently suspends transmission, it will ensure that data is not lost. There are options in SharpCap to turn DDR buffering on or off. The current version of the ASCOM driver has been working in DDR mode. 5. How to protect the refrigerator? The QHY294C's chiller can achieve an ambient temperature difference of nearly 35 °C. You should avoid thermal shock during use. The so-called thermal shock refers to the internal strong stress that the refrigerator has to withstand due to the thermal expansion and contraction principle when the temperature of the refrigerator suddenly rises or falls. The thermal shock of the distance shortens the life of the refrigerator. Even completely damage the refrigerator. Therefore, when you start using the chiller to adjust the CMOS temperature, you should avoid turning the chiller to maximum power and gradually increase the chiller power. If the power of the chiller is high before disconnecting the power supply, you should also gradually reduce the power of the chiller and then disconnect the power supply. 6. After the camera is turned on for a while, the frame rate drops to 0 after the DDR mode is turned on. How to solve it? Some users have reported that their frame with DDR module runs at SharpCap for a period of time and the frame rate drops to zero; this problem is caused by the high output rate of the CMOS chip and the slow reception rate of the computer. 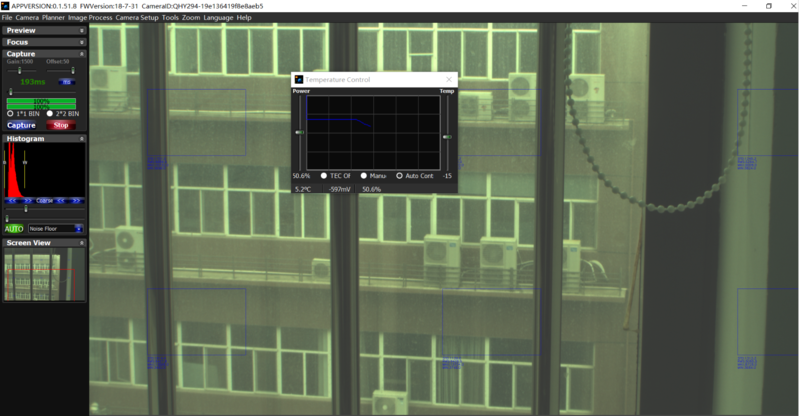 CMOS sensor starts working, it will be exposed continuously, output images, and will not repeat. If the computer suspends USB transmission too frequently due to the operating system, it will cause DDR data to overflow, causing bad frames to be generated continuously. 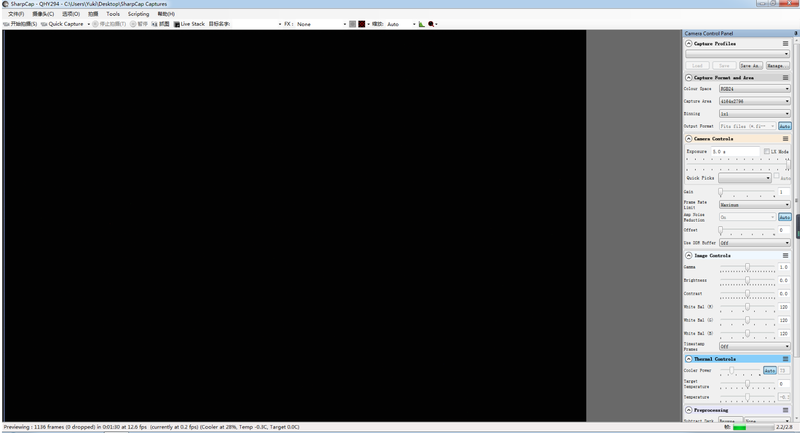 Image of the image entering the DDR is complete, so the frame rate is zero. The first method is to reduce the camera frame rate by increasing the value of USB traffic, thus avoiding camera jam. It should be noted that the previous SharpCap patch cannot set the value of USB traffic very large, so you need to download and install the Latest SharpCap patch on the official website. 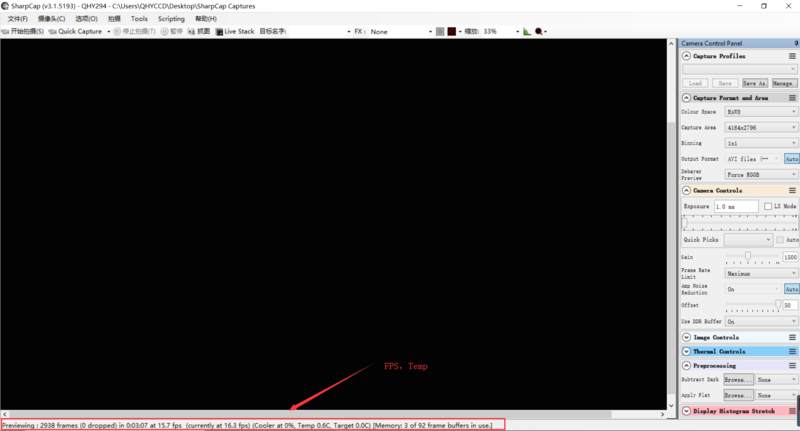 The second method is to turn off DDR mode in SharpCap, but for computers that are not very good in performance, this method is not specifically effective because of its slow data transfer speed. 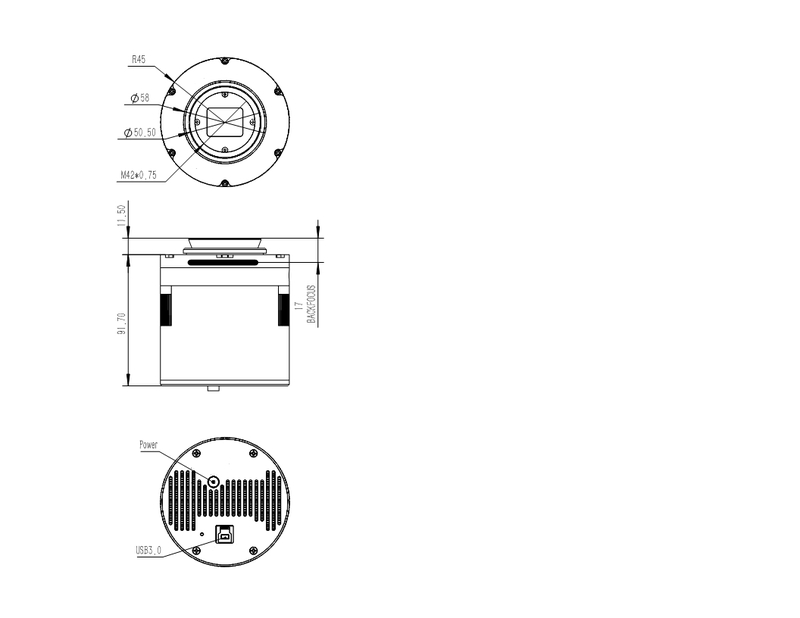 The CMOS sensor is located in the CMOS cavity. There is a hole in the side of the front end of the QHY294C camera. If there is moisture in the CMOS cavity that causes the sensor glass to fog, you can connect the silicone tube through this hole for drying. Place an effective silica gel desiccant in the silicone rod and make sure there is cotton inside to prevent the silicone from entering the CMOS cavity. 1. Avoid directing the camera towards the ground. The density of cold air is greater than the density of hot air. If the camera is facing down, cold air will be more accessible to the glass, causing it to cool down and fog. 2. Increase the temperature of the CMOS sensor. 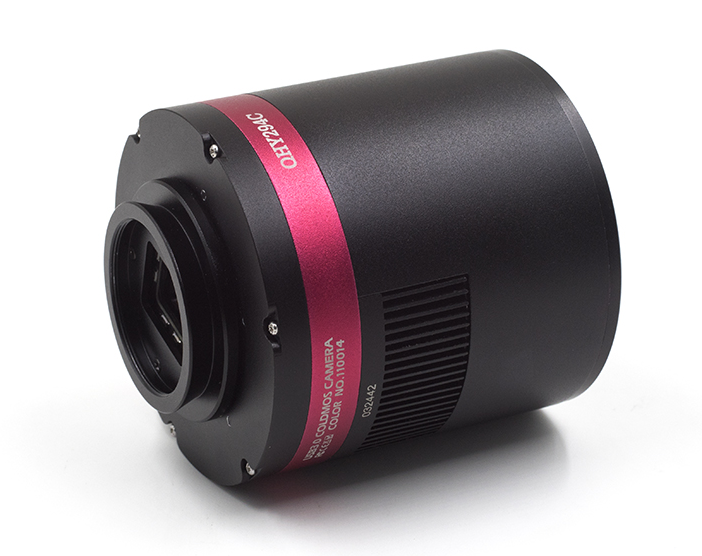 You can increase the temperature of the CMOS sensor slightly to prevent fogging of the glass. 3. Check if the heating plate is working. If the heating plate is not working, the glass will be very easy to fog. Normally, the temperature of the heating plate can reach 65-70 °C in the environment of 25 °C. If it does not reach this heat, it may be because the heating plate is damaged, you can contact us to replace the heating plate.